Today, Wizards of the Coast announced that the next version of Dungeons and Dragons (officially called DND5e, unofficially DND Next) will be free to play. Sorta. In a way, Wizards has embraced the Free to Play model a lot of MMOs use. In these MMOs, you can usually play a base class to a given level cap but to go beyond a level, or play different classes, you need to pay. 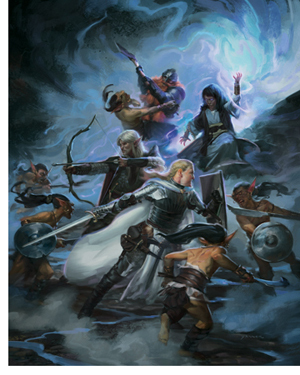 On July 15th (ish) along with the Starter Edition, Wizard will release a free PDF that’s basically the rules you need to play and the base classes (cleric, fighter, rogue, wizard) to level 20. If you want to play what they call an advanced class (Barbarian, Druid, Paladin, etc.) you will need to buy the Players Handbook which comes out a month later. The Basic Rules also have most of the equipment and some monster info so DMs can get their campaign up and running. I think this is a great idea and also gets around the big problem I have with the 5E release: the timing. When 4E launched, I could by a nice little boxed set with the core rules. This time, they are staggering the Player’s Handbook, Monster Manual, and DMs guides by roughly a month each. The other reason I think this is a great idea is it gets people to play and try out the new version of DND for free. I think 5E is far superior to 4E for reasons I’ll cover in a future post. Basically. 4E was a vey complex system. My character sheet was usually 7 pages long and half the skills were a reaction that required some type of event to trigger it. The fifth edition feels more like the 2nd edition, which was my favorite edition.